I don’t have much time for the long catch up post I owe you since I am right now in my booth at the Kentucky Sheep & Fiber Festival getting ready to start the day of business. I had a few spare moments and wanted to say hello. I do have a bit of news to share about my little dress pattern Sorrel. 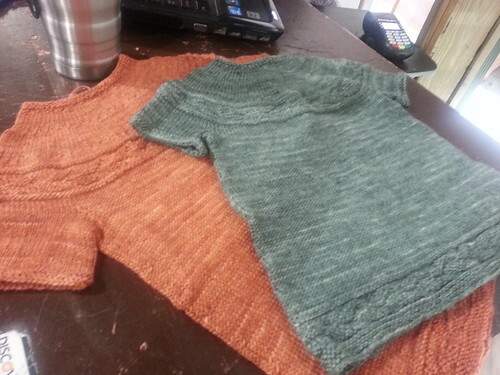 I received my first test knit back for the largest size between travels. I am very glad that it only took one skein of the Classic Merino Bamboo to make! So that means that for any of the three sizes you will only need one skein. Yay! Here’s a picture I took quickly in my booth this morning with my phone. I’ll get better ones later when I am ready to publish it. I am just waiting on the test knit of the small size first. The green one is the one I made (the middle size) and the orange is the large made by the talented Kristi Renshaw. :-) Thanks again Kristi! Lovely little dresses, so adorable! There is a new baby arriving in the extended family this fall. Will be so happy when i can make something other than neutral colors.lol. There is a large pile of baby clothes that just need finishing accumulating in the living room. Finishing is my vacation project. Looking forward to seeing you next weekend.